In her population study of mantled howler monkeys (Alouatta palliata), biologist Liliana Cortés Ortiz estimated just more than 11,000 individual primates remained. The study estimated 1,300 of the monkeys were in protected areas and 10,200 were in unprotected areas. 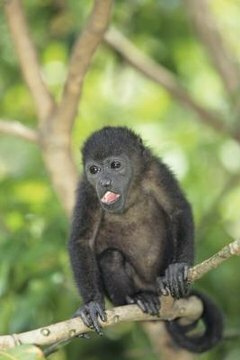 Perhaps more important than the number of mantled howler monkeys, however, is the conservation status of the five subspecies of this New World primate, whose cries can be heard for up to three miles. The International Union for Conservation of Nature (IUCN) Red List classified the mantled howler monkey as "least concern.” This listing describes species whose numbers are stable enough that they do not qualify to be listed as endangered, vulnerable of threatened. The U.S. Fish & Wildlife Service, however, has listed the mantled howler monkey as endangered since 1976. There are five subspecies of mantled howler monkeys, some of which do not fare as well on their conservation status. The IUCN Red List classifies the Mexican howler monkey (Alouatta palliata mexicana) and the Azuero howler monkey (Alouatta palliata trabeata) as critically endangered. This listing means it is "facing an extremely high risk of extinction in the wild." The Ecuadorian mantled howler monkey (Alouatta palliata aequatorialis) and the Coiba Island howler monkey (Alouatta palliata coibensis) are vulnerable, according to the IUCN, which means it faces "a high risk of extinction in the wild." The golden mantled howler monkey (Alouatta palliata palliata) received "least concern" status. While there is some hunting of the mantled howler monkey, the greatest overall threat to the primate's survival is habitat loss. Mantled howler monkeys spend almost all of their time in the trees and are somewhat awkward in their movements on the ground. The destruction of their forest habitats for agricultural and development purposes poses a serious threat to their survival. The survival of the forests also depends on the survival of the mantled howler monkey. In the interconnectedness of the rainforest ecosystem, the mantled howler monkey's dung disperses seeds and provides nutrition for certain types of beetles. The Convention on International Trade in Endangered Species of Wild Fauna and Flora (CITES) continues to list the mantled howler monkey on Appendix I, which means, "They are threatened with extinction and CITES prohibits international trade in specimens of these species except when the purpose of the import is not commercial." Such a purpose might include scientific research, for which a small number of mantled howler monkeys are used.